Throughflow is the sporadic horizontal flow of water within the soil layer (Figure 8m-1). It normally takes place when the soil is completely saturated with water. This water then flows underground until it reaches a river, lake, or ocean. Rates of water movement via throughflow are usually low. Rates of maximum flow occur on steep slopes and in pervious sediments. The lowest rates of flow occur in soils composed of heavy clays. Rates of throughflow in these sediments can be less than 1 millimeter per day. Figure 8m-1: Hydrologic movement of water beneath the Earth's surface. Water usually enters the surface sediments as precipitation. This water then percolates into the soil layer. Some of this water flows horizontally as throughflow. Water continuing to flow downward eventually reaches a permanent store of water known as the groundwater. The movement of groundwater horizontally is called groundwater flow. Precipitation that succeeds in moving from the soil layer down into the underlying bedrock will at some point reach an area of permanent saturation that is known as the groundwater zone (Figure 8m-1). The top of this zone is called the water table. Approximately 22% of the fresh water found at the Earth's terrestrial surface is stored as groundwater. Groundwater tends to flow by way of gravity to the point of lowest elevation. Often groundwater flow discharges into a surface body of water like a river channel, lake, or ocean. Typical groundwater flow velocities lie in the range of 250 to 0.001 meters per day. Highest groundwater flow velocities are commonly found in sedimentary deposits (like gravel, conglomerate, or sandstone) because of their very high permeability. The least permeable ground type occurs in dense igneous rock materials like granite. Rock formations that store groundwater water are known as aquifers. Rock formations that cannot store groundwater are called aquicludes. 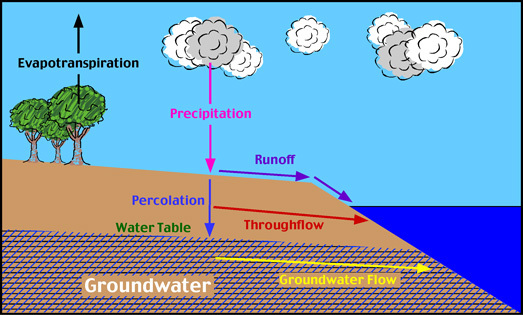 Groundwater occurs in two main forms. Unconfined groundwater occurs when the flow of subterranean water is not confined by the presence of relatively impermeable layers (Figure 8m-2). The presence of an impermeable layer beneath this type of groundwater can cause the formation of a perched water table. These features are elevated some distance above the surface's main water table. Springs that flow from underground to the Earth's surface are often formed when a perched water table intersects the surface. Figure 8m-2: Unconfined groundwater, perched water tables and the development of springs. In some cases, groundwater can become confined between two impermeable layers (Figure 8m-3). This type of enclosed water is sometimes called artesian. If conditions are right, a confined aquifer can produce a pressurized ground to surface flow of water known as an artesian well. In an artesian well, water flows against gravity to the earth's surface because of hydrostatic pressure. Hydrostatic pressure is created from the fact that most of the aquifer's water resides at an elevation greater than the well opening. The overlying weight of this water creates the hydrostatic pressure. Figure 8m-3: Confined groundwater and the development of an artesian well.